Thirty-four established and emerging writers from the Fredericksburg area share their vision of our frailties, historical roots, occupational choices, marital and family challenges, and tributes to a spouse or in-law. 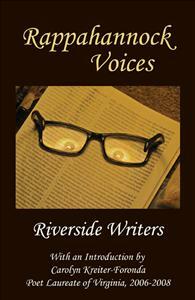 The anthology Rappahannock Voices treats an array of timely themes with intriguing insights. Some of the poems and works of fiction and nonfiction address our frailties or the battle scars of past wars, while others contemplate historical roots, occupational choices, marital and family challenges. Still others reflect on life’s fleeting nature or lovingly pay tribute to a spouse or in-law.